You’ll see us as soon as you pull off the main road. There’s lots of parking outside and once you’re inside you’ll find a large choice of paints and wallpapers to choose from, as well as a selection of decorators’ equipment. You can use our customer internet points to search through the thousands of wallpaper and designer paint products available to order into store. 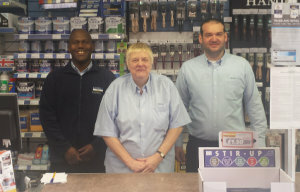 If you have any questions, please don’t hesitate to ask – our staff have many decades of experience in the industry and know our products inside out. 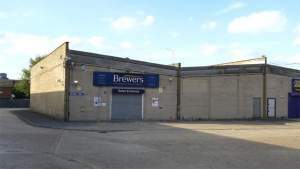 The Woolwich Brewers Decorator Centre is handily located just off the A206 Woolwich Church Street. The A206 is a dual carriageway, but there’s a slip road allowing you to cross onto the Dockyard Industrial Estate from the north side of the road. You’ll know you’re getting close and need to slow down when you spot the 180ft-tall brick chimney. It’s unmistakeable, built in 1840 and Grade 2 listed. Follow A206 Westbound and then turn right into Woolwich Dockyard Industrial Estate. Follow A206 Eastbound and then turn left into Woolwich Dockyard Industrial Estate. This is the entrance to Woolwich Dockyard Industrial Estate.